Seventy years after opening its doors to veterans returning from World War II, UNCW continues to honor active-duty and veteran members of the armed services. For the second year in a row, the Office of Military Affairs will celebrate America’s veterans with a full week of events. “We look forward to sharing this recognition with all Seahawks and throughout the greater Wilmington community,” said Bill Kawczynski, director of the Office of Military Affairs. Veterans’ Week kicks off with a 5K race in collaboration with paws4people/paws4vets beginning at 10 a.m. on Saturday, Nov. 4 on the UNCW campus. Registration is open now. 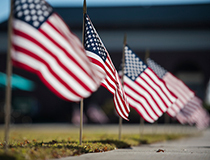 On Sunday, more than 2,000 American flags will be placed around campus – one for each military-affiliated student, faculty or staff member. Justin Constantine, a retired Marine Corp Lieutenant Colonel, veteran advocate and author, will deliver an address at 4 p.m. on Nov. 6 in Kenan Auditorium. While serving in Iraq, Constantine was shot in the head by a sniper. Although originally thought to be killed in action, he survived thanks to his fellow Marines and a courageous Navy Corpsman. For his service, he earned the Purple Heart, Combat Action Ribbon and Navy-Marine Corps Commendation Medal. In 2012, the Virginia Legislature passed a commending resolution highlighting Constantine’s continued support of veterans and other wounded warriors. He is a Presidential Leadership Scholar, was named a Champion of Change by the White House and was the recipient of the prestigious inaugural 2014 Lincoln Award. The week will conclude on Friday, Nov. 10 with the annual Veterans’ Day Ceremony at the Campus Amphitheater beginning at 10:45 a.m. In the event of rain, the ceremony will be moved to the Burney Center.